In this exclusive audio interview Emmy Winner Charlotte Robinson host of OUTTAKE VOICES™ talks with Jonathan D. Lovitz, Vice President of External Affairs of the National Gay & Lesbian Chamber of Commerce about the NGLCC International Business & Leadership Conference that takes place August 23rd to 26th in Palm Springs, California. The event brings over 1,000 entrepreneurs, corporate decision-makers, affiliate chamber leaders and government officials from across the country and globally. There are also fabulous special events including a performance by legendary singer-songwriter Melissa Etheridge. The three-day educational conference delivers innovative leadership programming, networking and engagement opportunities which lead to expansive economic impact and meaningful community services. These cutting edge educational programs include important keynote speakers, the annual B2B Boot Camp for LGBT Business Enterprises, a chamber development track, marketplace expo, one-on-one matchmaker meetings and more. The NGLCC International Business & Leadership Conference offers vigorous programming designed to meet the interests and needs of their corporate partners, LGBT-certified business owners and entrepreneurs, allied companies and NGLCC affiliate chambers from around the country. Packed with education sessions, this world-class networking the conference offers incredible exposure and opportunities for LGBT owned and allied businesses to build relationships with more than 140 corporations, federal government agencies and each other. 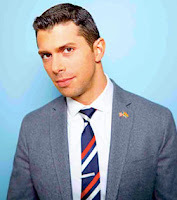 We talked to Jonathan about the NGLCC International Business & Leadership Conference and his spin on our LGBT issues. The NGLCC was co-founded in 2002 by Justin G. Nelson and Chance Mitchell. Nelson has served as President since the NGLCC was founded and Mitchell has served as CEO over the same period. In 2002 the pair were named in OUT Magazine's Top 100 Success Stories for their role in founding the NGLCC Instinct Magazine and named Nelson as one of their 25 leading men in 2006. NGLCC is a U.S. not-for-profit advocacy group that aims to expand the economic opportunities and advancement of the LGBT business community. The Washington, D.C. based group acts both as a national certification body for LGBT-owned businesses and as advocates for LGBT supplier diversity. In this exclusive audio interview Emmy Winner Charlotte Robinson host of OUTTAKE VOICES™ talks with Jai Rodriguez about Richmond Ermet Aid Foundation’s event HELP IS ON THE WAY 22 – On The Red Carpet "Idols & Icons" on Sunday August 21st which is Northern California’s largest annual, star-studded concert and gala that benefits Meals on Wheels of San Francisco and AIDS Legal Referral Panel. This fabulous event will feature tributes to Stephen Sondheim, Carole King, David Bowie, Natalie Cole, Prince and more. Jai will be performing along with Constantine Maroulis, Kimberley Locke, LaToya London, Melinda Doolittle, Marissa Jaret Winokur, Donna McKechnie, Carole Cook, Michael Walters as Dame Edna, Branden James with James Clark, Paula West, Sally Struthers, Jason Brock, Sony Holland, Tristan Bourgade and the cast of “Beautiful.” For over twenty years the Richmond / Ermet Aid Foundation has raised millions of dollars by producing Broadway quality entertainment events and galas to advance HIV treatments and support AIDS services until there is a cure. Recently REAF has expanded its fundraising focus to the Bay Area’s growing demand for two new areas by providing food for the needy and programs that support homeless, disadvantaged and disenfranchised youth. We talked to Jai about this tremendous organization and his spin on our LGBT issues. HELP IS ON THE WAY XXII is produced by the Richmond/Ermet Aid Foundation, founded by the late Barbara Richmond and Peggy Ermet in memory of their sons John Richmond and Doug Ermet who both lost their lives to AIDS. In 1995, the two women decided not to get mad but get even when they launched a musical AIDS benefit to honor their sons by raising funds for AIDS service organizations. To date REAF has raised well over $3 million dollars for AIDS services and beginning in 2015 expanded to support hunger programs and programs for homeless and underserved youth. In this exclusive audio interview Emmy Winner Charlotte Robinson host of OUTTAKE VOICES™ talks with Filmmaker Ray Yeung about his new feature “Front Cover” a bittersweet dramatic comedy that addresses the Asian American experience with humor, irony and insight. The film is about an openly gay New York City fashion stylist Ryan (Jake Choi) who has rejected his traditional Asian upbringing. However after he is given an assignment to style Ning (James Chen) a famous Chinese actor for an important photo shoot an unlikely friendship develops between them leading Ryan to re-examine his roots and consider an enticing new path for his life and career. “Front Cover” is opening in limited release on August 5th in New York City at the Village East and August 12th in Los Angeles at Sundance Sunset 5 distributed by Strand Releasing after rave reviews on the film festival circuit. We talked to Ray about his inspiration for “Front Cover” and his spin on our LGBT issues. 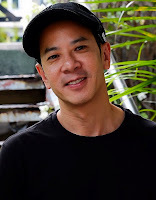 Ray Yeung is a Columbia University MFA graduate whose first film “Cut Sleeve Boys” premiered at the Rotterdam International Film Festival and won Best Feature at the Outfest Fusion Festival in Los Angeles. Yeung is very concerned with the whitewashing of Asian stories in Hollywood and is committed to continue making films about our Asian LGBT community. His next film will be shot on location in his native Hong Kong which not only tells the story of two Asian men but will also capture a rapidly changing city under China’s rule. Ray Yeung continues to be the Chairman of the Hong Kong Lesbian and Gay Film Festival.